The snow has melted. My cold has faded. The Brewconomy Kickstarter campaign is 47% funded with 19 days to go. Right now, life is pretty great. Also, I’m finally feeling home. Derek and I moved into the new digs a few weeks ago. We’re still packing, unpacking, and getting accustomed to living in the new house. But we’re making progress every day. I can quickly find things like shoes or dishes when I need them. So that’s huge. There are little places in the new house that look so beautiful. They are so styled. So pretty. 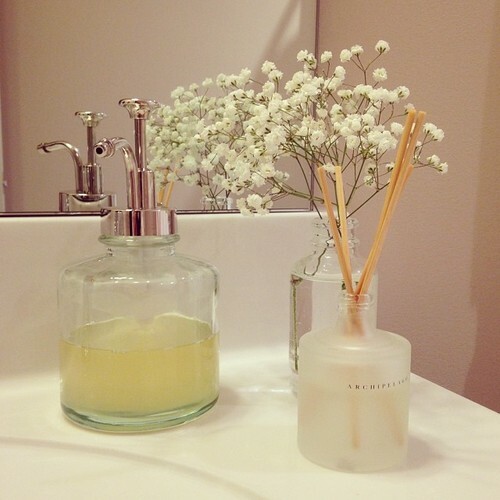 This is a little vignette from the guest bathroom. It makes me entirely too happy. But there are other spaces that are so messy. (Even a little smelly.) One of the messiest is my beloved studio. It has a looooong way to go. Which is one of the reasons why you haven’t heard as much from me as usual. I’m still working out the space in which I do my writing and working. It’s a hot mess right now but I’m getting there.